Fionnuala Jay-O’Boyle tells Lindy McDowell about meeting the Queen and Meghan Markle, her childhood in Londonderry and how her musical ambitions were cruelly thwarted. There is an old saying that if you want something done, ask a busy person. In that spirit, should you need a hand out, I’d suggest looking no further than Fionnuala Jay O’Boyle. Let’s just say the indefatigable Mrs Jay- O’Boyle CBE is a doer. Her CV (too long to reproduce here) cites a list of impressive organisations, a couple of which, having seen the niche or the need, she founded herself — Jay Associates, a public and government affairs consultancy, and the Belfast Buildings Trust. But it’s not the trajectory of her public service that is the most impressive thing about the woman who currently holds the title ‘Lord Lieutenant of the County Borough of Belfast’. It’s the lady herself. The 57-year-old is one of those people with a genuine gift for immediately putting you at your ease. She’s warm, personable, engaging and interesting. And she could talk for Ireland. All these are attributes, needless to say, in her role as Her Majesty, the Queen’s Lord Lieutenant for this particular ‘county’ of the UK. The Lord Lieutenant is the Queen’s personal representative here, and the role requires that he or she uphold the dignity of the Crown and engender a positive atmosphere and a spirit of co-operation, as well as organise official royal visits. With considerable admiration, Fionnuala describes the Queen as “a formidable lady” — the same phrase she uses to describe her own mother, Betty. Her Majesty’s visit to the Republic of Ireland was she adds, “a shifting of tectonic plates”. She cites too the visit of Prince Charles to Glasnevin Cemetery, where he laid wreaths in memory of all from Ireland who died in the world wars and all who died in the Easter Rising. Fionnuala herself was the first Lord Lieutenant since Partition to lay a wreath at Glasnevin to commemorate all the Irish men and women who served in the First World War. “At an event commemorating the Battle of Jutland, I remember being struck by the number of families from Tralee and Dingle and all over Ireland,” she says. Of the Queen, she adds: “There is absolutely a graciousness about her that is quiet and breathtaking. A majesty and a graciousness. Fionnuala says she is delighted that Prince Charles will follow his mother as the next Head of the Commonwealth. The role is not hereditary, but the 92-year-old Queen did say it was her “sincere wish” that Charles would follow her. Fionnuala also points to the youth work being done by the new generation of younger royals including William and Kate, the Duke and Duchess of Cambridge. The couple’s engagements here included a visit to Amazing the Space, in Lisburn, which helps young people across Northern Ireland become ambassadors for peace within their own communities. They also dropped in on Catalyst Inc in Belfast, which provides support for young entrepreneurs, visited the Titanic centre and also called into the historic Crown Bar. It is this sort of packed visit which Fionnuala and her team have to co-ordinate. Does she have a favourite royal? She is much too discreet to say. But she does talk about favourite royal moments, among them the Queen travelling by train past Benone strand and the hills of Downhill, and the Duchess of Gloucester sharing a fun-filled afternoon tea with the entire Fleming Fulton School on the occasion of the school’s 50th birthday. Fionnuala is the third female — and the third woman in a row — to hold the title, following in the footsteps of Olympian Dame Mary Peters (2009 to 2013) and Lady Romayne Cardwell (2000 to 2009). The first Lord Lieutenant here was the 6th Marquess of Londonderry, the grandly monikered Charles Stewart Vane-Tempest-Stewart. 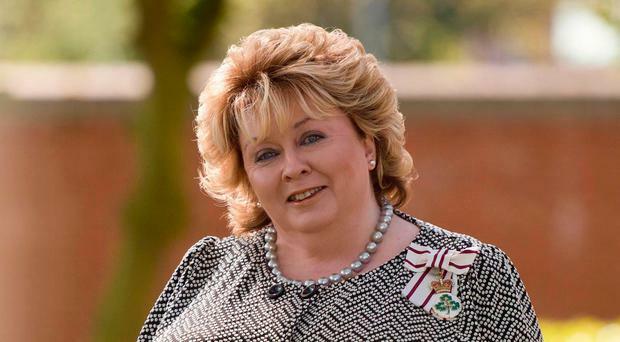 From a nationalist background in Londonderry, did she take flak when she took on a role so closely connected with the Royal Family? She remarks that there were undoubtedly a few comments made, “But for me it was never an issue”. Her original dream was to be an opera singer, and by the age of 21 she’d already attracted the attention of the Guildhall company in London. “They told me, quite rightly, I was too young and would have to wait until I was 23,” Fionnuala says. But then life cruelly dealt a hammer blow. She was struck down with a rare strain of glandular fever. The illness, which was to return in her early 30s, put paid to her professional singing ambitions. She grew up in a happy, close- knit, middle-class family in Derry. Her late father, Tommy, worked in the transport industry, and her mother, Betty, is a retired teacher. She has a brother, Rory, and a sister, Niamh, to whom she is very close. Despite Derry’s troubled history, she remembers coming to Belfast in the Seventies to study at Queen’s and the “pretty major shock to the system” of the polarisation and sectarianism she found in the city. A city, it must be said, she has come to adore. “I have never, ever regretted staying in Belfast. There is a grittiness, a warmth and a charm about this city and its people that is unique. “And something that you never find anywhere else in the world either — a city framed by an amphitheatre of hills. Wherever you are in Belfast you can see those hills. It is a spectacular city. “My heart always quickens when the plane comes in over it or when I’m coming down the M2 ... that breathtaking view of Belfast harbour as you come down into the city. Her team includes 22 deputies, and on any one night there can be several functions to attend. St George’s Market (“Can you believe that once it was under threat and they tried to close it down?”) is a favourite haunt. “The vibrancy is so quintessentially Belfast. Despite her packed schedule — or maybe because of it — she’s careful about her health, especially in the light of the illness that returned in her early 30s. She describes herself and Richard as opera travellers taking in performances in the likes of Milan and Barcelona. The Belfast’s Lord Lieutenant’s office is one of the busiest outside London, she informs me at one point.